NEW: Use CallRail as a data source – How can we help you today? Save time and add pre-built Klips with the Klip Gallery! Note: This guide assumes that you already have an active CallRail account. 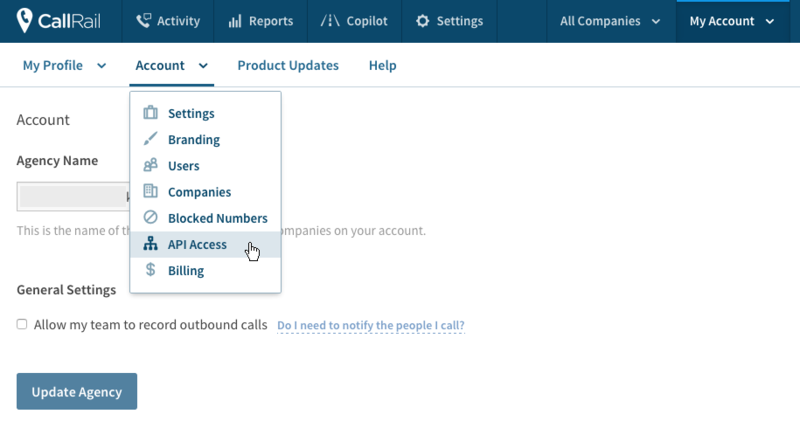 To create a data source using CallRail, go to the New Data Source page in Klipfolio and select the Web Accessible Resource option. Open a new browser tab and sign in to your CallRail account. On the CallRail homepage, select My Account. In the My Account dropdown menu, select Account. Select the Account dropdown menu. Create a new API Key and/or copy your API Key and paste it into Klipfolio. CallRail offers a variety of query options from which you can retrieve data. All of them use Signed Authentication. Refer to the CallRail Data Export API to find out more. At Data Format, select JSON from the drop-down list. Select the Query Parameters drop-down menu. Under Type, select Header from the drop-down list. If you are satisfied with the data returned, select Continue.